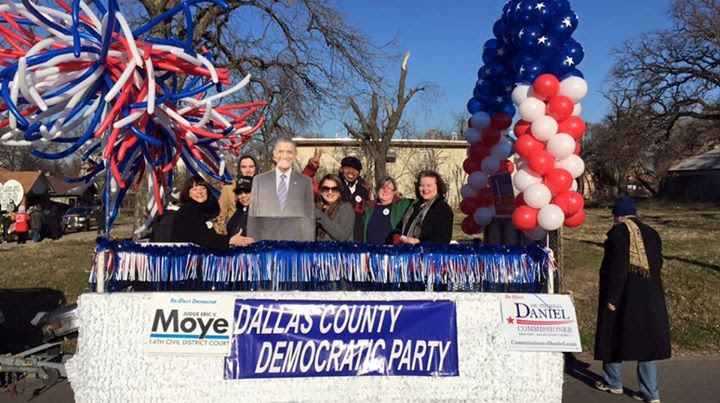 Dallas County Democrats, officials, and candidates took part inMonday’s Martin Luther King Jr. Parade. Above is the DCDP float. The Dallas County Democratic Party has posted a job notice for the position of Executive Director (ED). The Executive Director will manage the staff at the DCDP office, direct day-to-day operations of the Party, and will report directly to DCDP Chair Carol Donovan. Click the link for a job description for the ED position. Individuals and organizations are encouraged to distribute the job description to those they know who might be interested in applying. For questions, contact the DCDP Office at 214-821-8331. To apply, candidates should email a cover letter, expressing their interest, with salary expectations, a resume, a writing sample, and at least 3 professional references to ED Search Committee Chairwoman Barbara Rosenberg at barbara ATdallasdemocrats.org. All documents must be received on or before February, 4, 2016 by 5:00 p.m. CST. 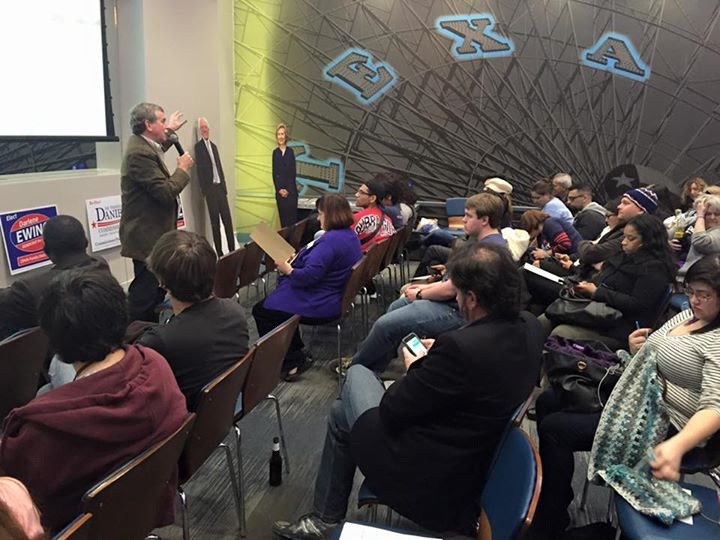 Texas Railroad Commissioner candidate Lon Burnam speaking to Dallas Democrats at the DCDP Presidential Debate Watch Party at Dave And Buster’s Sunday, January 17, 2016. To his left, stand-ups of two of the Democratic candidates for President. Because the DNC did not allow Texas to have another waiver, we’ve seen our last Texas Two-Step of primary and caucus. That means there will be no precinct conventions on the evening of the Texas Primary, March 1 (Super Tuesday). Instead of attending Precinct Conventions on Primary night, you go to your District Convention March 19 to caucus by precincts there. Read this memo from the Texas Democratic Party to learn the steps to becoming a delegate and how many delegates are allotted to your senate district. Senate District Conventions will be held on Saturday, March 19, 2016. The State Convention will be held June 16-18, in San Antonio. Philadelphia hosts the Democratic National Convention the week of July 25. To those running to be a national delegate, good luck! At the County Executive Committee meeting Monday night, the Precinct Chairs present from each State Senate District caucused and elected Temporary Chairs or Co-Chairs for each of their Senate District Conventions. Those will be held this year on Saturday, March 19 at locations in each district. This year there will be no Precinct Conventions on Primary Election Day. Instead, Democratic voters from each precinct will gather at their Senate District Conventions to caucus and choose delegates to the State Convention this summer. Help Make It A Democratic New Year! The Sustaining Membership is an opportunity for Democrats to show their support for the party. As you know, the party operates to serve the party membership, elected officials, candidates and other activists and voters throughout the county. The members are the backbone of the party. Their continuous activities keep Democrats in office, and keep our values alive in a sea of RED. The challenges to our issues and candidates always need support. That support comes from a viable party office. As you can imagine, it costs plenty to keep us running and keep us BLUE. The only way to make sure the office is fully funded is through Sustaining Member contributions. Your regular donation of as little as $10 a month is an investment in the future of the local Democratic Party. Thank you for your contributions and concern for DCDP. We have several levels of Sustaining Memberships, each with its own category name and benefits. Read about them all and choose your level to get (or renew) your Sustaining Membership at this page. UPDATE: We will shortly be starting a phone bank to ask people to begin (or renew) Sustaining Memberships in the DCDP. If you can help phoning, call Carmen at 214-821-8331 or email Chris At DallasDemocrats.org. Deadline to register to vote in the March 1 Primary.